PCHR warns of the escalating settlement construction in the West Bank, the attempts to legitimize settlement outposts established on Palestinian lands in the West Bank and the continued summary executions of Palestinian civilians under the pretext that they pose a security threat to the Israeli forces. PCHR reminds the international community that thousands of Palestinian civilians have been rendered homeless and lived in caravans under tragic circumstances due to the latest Israeli offensive on the Gaza Strip that has been under a tight closure for almost 11 years. PCHR welcomes the UN Security Council’s Resolution No. 2334, which states that settlements are a blatant violation of the Geneva Conventions and calls upon Israel to stop them and not to recognize any demographic change in the oPt since 1967. PCHR hopes this resolution will pave the way for eliminating the settlement crime and bring to justice those responsible for it. PCHR further reiterates that the Gaza Strip and the West Bank, including East Jerusalem, are still under Israeli occupation in spite of Israel’s unilateral disengagement plan of 2005. PCHR emphasizes that there is international recognition of Israel’s obligation to respect international human rights instruments and international humanitarian law. Israel is bound to apply international human rights law and the law of war, sometimes reciprocally and other times in parallel, in a way that achieves the best protection for civilians and remedy for the victims. The advancement of settlement units continued at an unprecedented high level during the second half of 2018 (July-December), according to a recent EU report on Israeli settlements in the occupied West Bank, including East Jerusalem. More than 7,000 units in the occupied West Bank (4,350), including East Jerusalem (2,900), were advanced in different stages of the planning and implementation process (tenders and plans). The report said that several important developments took place during the reporting period. In East Jerusalem, Israeli High Court decisions brought between 600 and 700 Palestinians at risk of being evicted in Batan al Hawa (close to the Old city) and families in Sheikh Jarrah (32 persons) lost their final appeal against eviction. A development that will deepen the Israel control of East Jerusalem and the Old City Bassin. In December, the Israeli government announced that it would allocate land at the Givat Eitam outpost site for the purpose of planning a new settlement in the strategic “E2” area, that potentially will cut off Bethlehem from the southern West Bank, completing the near encirclement of Bethlehem by Israeli settlements. The many settlement approvals also included plans that will effectively regulate two new settlements (by legalizing the unauthorized outposts of Ibei Hanachal and Gva’ot) and establish two new settlement industrial zones (one near the Beitar Illit settlement and one near the Avnei Hefetz settlement). The total advancement of settlement units in 2018 (January-December) amounted to more than 15,800 units (9,400 units in the West Bank and 6,400 units in East Jerusalem). The figures show a sharp spike in planning for future construction. This development will, over several years, enable potentially more than 60,0001 Israeli settlers to move to the Occupied West Bank, including East Jerusalem. According to the PNN, there are currently approximately 215,000 Israelis living in East Jerusalem, while the settler population in Area C in the occupied West Bank, excluding East Jerusalem, is some 413,0002 . This brings the settler population to approximately 630,000 Israeli settlers in 143 settlement locations in the West Bank (132) including East Jerusalem (11)3 and 106 outposts. Settlements are illegal under international law as reaffirmed by UN Security Council Resolution 2334 (2016) and the developments on the ground make the prospect of a two-state solution, with Jerusalem as the future capital of both states, increasingly unattainable. Ofer jail, that was described as “the most dangerous” since the 2007 attack in Negev prison. Palestinian Centre for Human Rights (PCHR)On Friday afternoon, 01 February, 2019, in use of excessive force against peaceful protesters on the 45th Friday of the Great March of Return in the eastern Gaza Strip, Israeli forces wounded 98 civilians, including 15 children, 4 women; 2 of them are paramedics, and a journalist. The injury of 7 of those wounded were reported serious, including a 17-year-old girl who was shot with a bullet to the chest in eastern Khan Younis. According to observations by PCHR’s fieldworkers, though the demonstrators were around tens of meters away from the border fence, the Israeli forces who stationed in prone positions and in military jeeps along the fence continued to use excessive force against the demonstrators by opening fire and firing teargas canisters at them. As a result, dozens of them were hit with bullets and teargas canisters without posing any imminent threat or danger to the life of soldiers. Hundreds, including children and women, gathered along the border fence with Israel in front of each encampment and protested between tens and hundreds of meters away from the border fence. In seevreal area, the demonstratorsmoved hundreds of meters away from the encampment to protest in front of the border fence with Israel, and some of them attempted to throw stones at the Israeli forces in addition to chanting slogans. In very limited incidents in Rafah, a group of demonstrators approached the border fence and set fire to tires. Although the demonstrators gathered in areas open to the Israeli snipers who were stationed on top of the sand berms and military watchtowers and inside and behind the military jeeps, the Israeli forces fired live and rubber bullets in addition to a barrage of teargas canisters at them. The Israeli shooting, which continued until around 17:30, resulted in the injury of 98 Palestinian civilians, including 15 children, 4 women; 2 of them were paramedics, and a journalist. The injury of 7 of those wounded was reported serious, including a 17-year-old girl who was shot with a bullet to the chest in eastern Khan Younis. 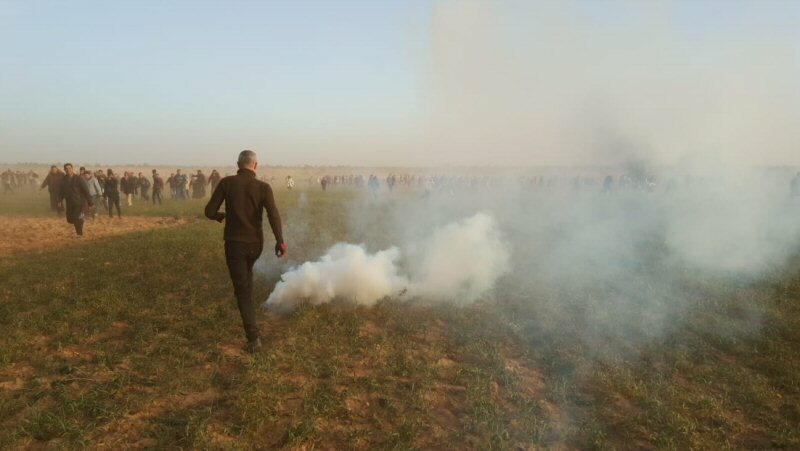 Moreover, dozens of demonstrators, paramedics and journalists suffered tear gas inhalation and seizures due to the tear gas canisters that were fired by the Israeli forces from the military jeeps and riffles in the eastern Gaza Strip. gas inhalation and sustained bruises. PCHR emphasizes Palestinians’ right to peaceful assembly that is guaranteed by all International human rights instruments, stressing that the Israeli forces should stop using excessive force and respond to the legitimate demands of the demonstrators, particularly lifting the closure which is the real solution to end the humanitarian crisis in the Gaza Strip.